Another picture from our trip down to the beach on Sunday. 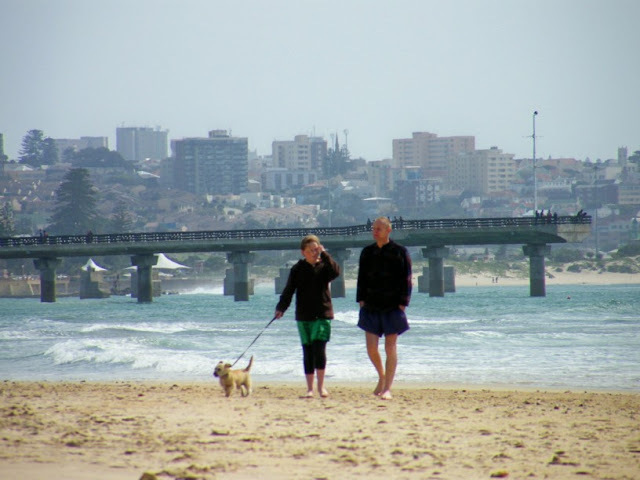 A couple (not sure if it an actual couple or father and daughter, but that doesn't matter) taking their dog for a walk with Shark Rock Pier and a part of Central in the background. It was an unusual angle as you don't often see the pier with town looking so close in the background. We took a drive down to the beachfront this afternoon to get out the house a bit. We stopped on Lovers Lane and sat on a bench overlooking the sea having a picnic while the kids were running up and down on the sand. There wasn't a lot of people down on the beach as it wasn't really a warm day, but we could see a couple of fishermen on the rocks at Pollock Beach by the old Something Good parking lot. The area of Central just about the Port Elizabeth CBD used to be called The Hill in the early day. It was because the area is situated at the top of quite a steep hill and it was a struggle to get horse carts, ox wagons and even the tram up the steep bit to the top. This pic is taken from the top of the Donkin Lighthouse looking towards on of the older parts of Central. In the foreground on the left is The Hill Presbyterian Church and on the right is the historic Donkin Street houses which was built in the 1850's. 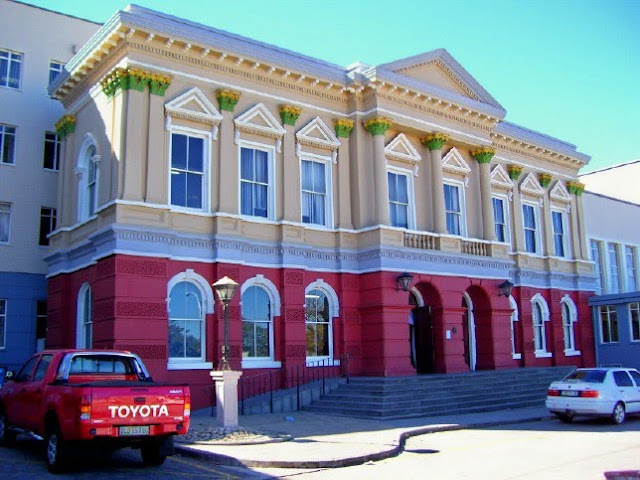 The Port Elizabeth Opera House was opened in 1892 and was proclaimed a national monument in 1980. 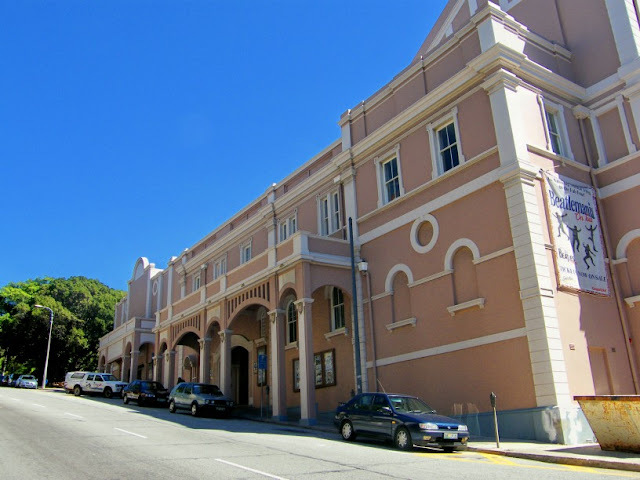 It is the oldest functioning opera house in the country as well as the only remaining Victoria theatre in South Africa. 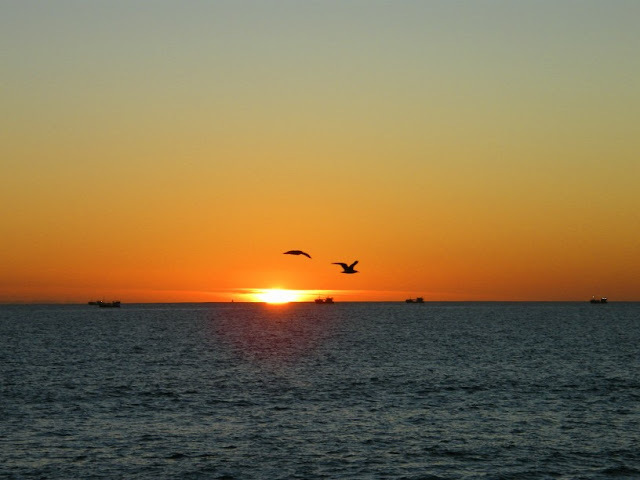 This is sunrise over Algoa Bay here in Port Elizabeth. The start of another perfect day. This pic was taken a couple of minutes after the Chokka Boats at Sunrise pic of a week or so ago. For more absolutely breathtaking photos involving the sky, go to Skywatch. Just over a month ago I posted a pic of the PE beachfront's light which was taken from Shark Rock Pier at Hobie Beach. Yesterday I popped down to the beach during lunch time as the weather was absolutely awesome (yes, spring is banging the door down). I took a picture of the same piece of coastline from the pier to show you what it looks like during the day. I'm a sucker for old historic grave yards. For me there is just an air of peace and history and... sommer maar net something that always attracts me to them. 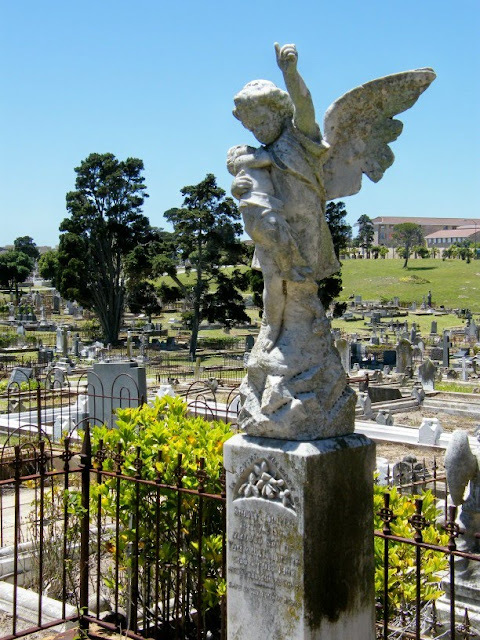 In the picture is one of the old gravestones in the South End cemetery. The building in the background is the Humewood Police Station. On my way home from the rugby on Saturday I drove up Heugh Road and saw the Apple Express steam train coming down the narrow gauge line from its day trip to Thornhill. I veered off to the closest crossing and got there just in time to take this pic. By the time the camera (curse these compacts, no matter how advanced, which takes a second or two to reset) was ready for the next shot, she was next to me already and I couldn't line up another decent pic. The Eastern Province Rugby Stadium is also better know by its old name of Boet Erasmus Stadium. 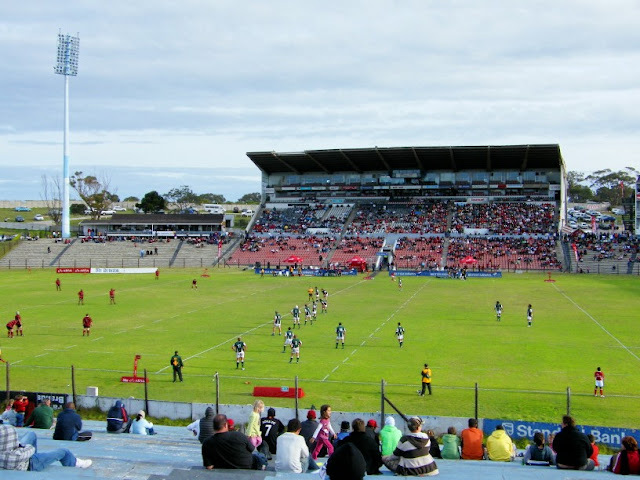 The stadium is home to the Eastern Province Rugby Union (EPRU) and the provincial team is know as The Mighty Elephants and seats about 35000 people. In the picture you can see the main stand while the open stand only consist of cement steps and doesn't have and seats. Its far from a modern stadium, but there is a reason (except for the EPSU's financial problems) for the stadium not getting any major renovations. 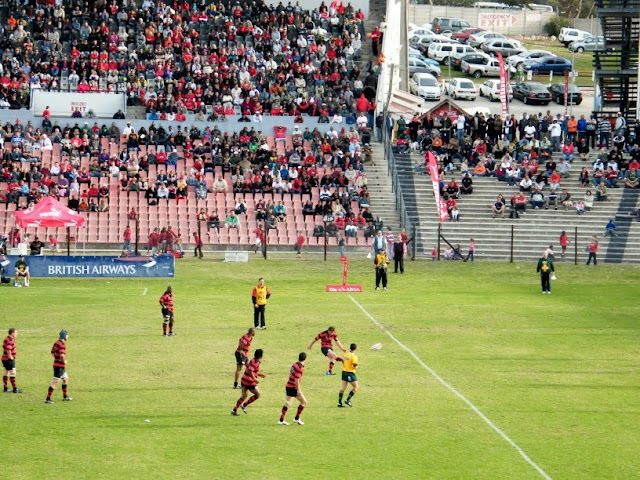 The EPRU will eventually (probably after the 2010 FIFA World Cup) move to the new Nelson Mandela Bay Stadium which will become home the Mighty Elephants. The stadium has in the mean time been identified as one of the possible sites for the development of an International Convention Centre. The once mighty Eastern Province rugby side have been bottom feeders in provincial rugby for the last decade or so and has been struggling both on and off the field. This season has seen a bit of a revival in the boardroom which is slowly starting to spill onto the field. EP is currently lying 4th on the table in the Currie Cup "B" section. They played the 3rd placed South Western District Eagles on the Eastern Province Rugby Stadium this afternoon and lost a close game 15 points to 6. And believe me, SWD didn't win it, EP lost it. It could easily have gone the other way. Here the flyhalf is kicking for goal from a penalty. 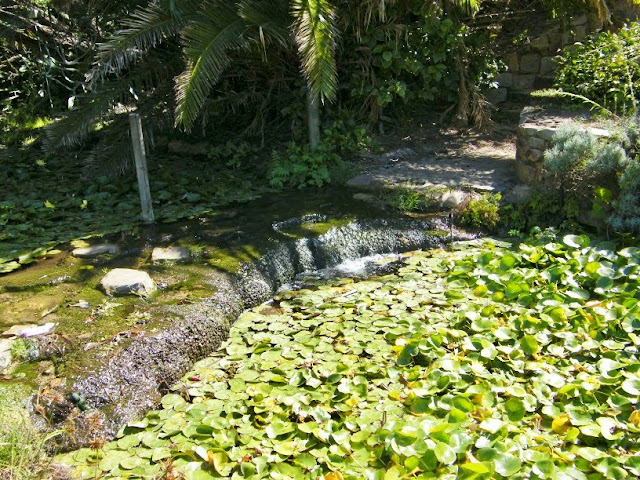 Towards the end of the 18th century settlers settled in the Swartkops River valley. Amongst them were and Gert and Johanna Scheepers who's farm De Rietvallei was the site of what was to become the town of Uitenhage. 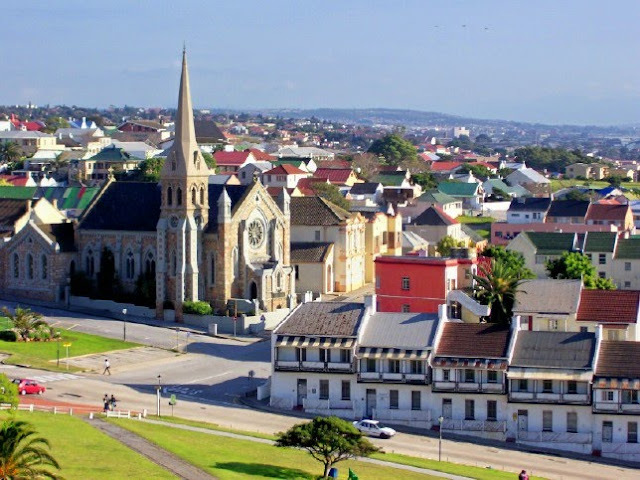 Known as the Garden Town, Uitenhage was originally a farming community on the banks of the Swartkops River. Which as today grown into a thriving commercial and industrial area without loosing its picturesque charm. 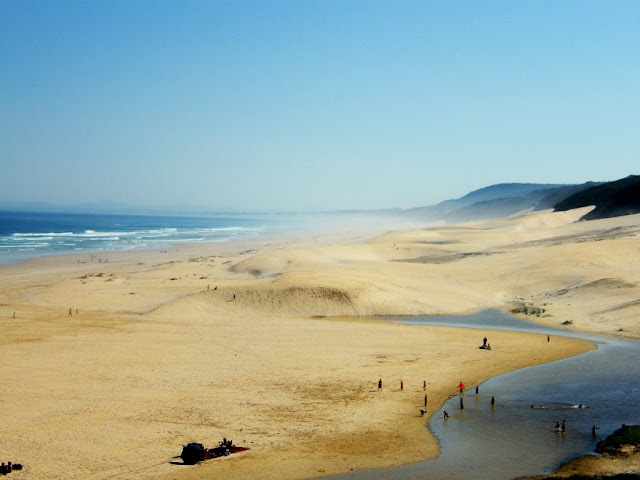 Situated only 30 km from the coast. It was founded in 1804 and is named after commissioner General J.A. Uitenhage de Mist. 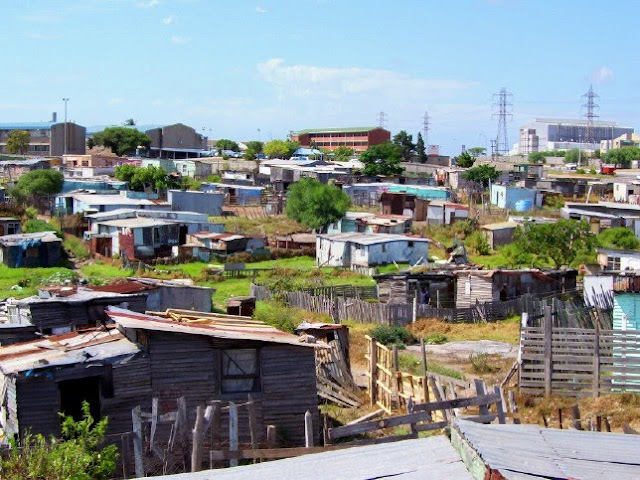 Ramaphosa Village is one of the informal settlements (squatter camps) here in Port Elizabeth. It is situated close to the industrial area of Struandale. You often find informal settlements like this close to industrial areas as that is where the men will most likely find work. The houses consist mainly of wood and corrugated iron. I used to pass through the townships on a regular basis on township tours when I still guided, but at that stage I never really had a lot of opportunity to take much photos around the township. I hope to go on a township tour with one of my guide friends somewhere in the near future and then I will do a whole series on township life here and on The Firefly Photo Files. 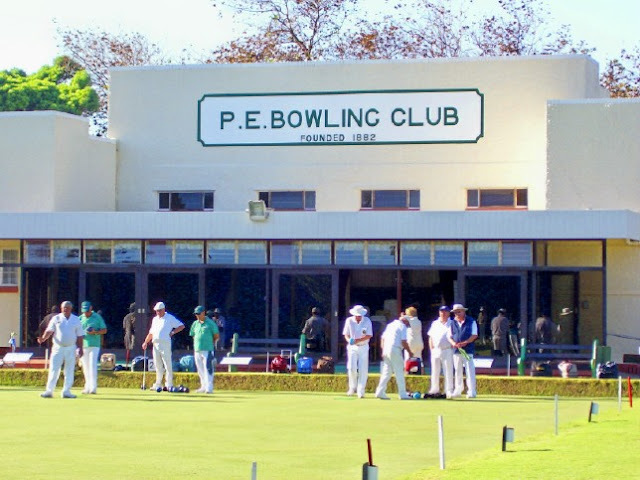 The Port Elizabeth Bowling Green Club, the oldest in South Africa, was founded on August 14, 1882. The first lawn, or "green," as they are known by the bowling fraternity, was opened on January 5, 1884 in the picturesque setting of St George's Park. The second green was opened in 1887 followed by a third (1896) and fourth green (1926). 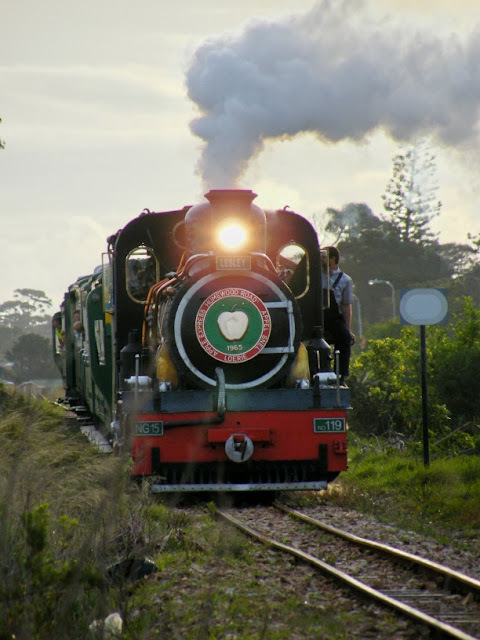 The first South African Inter-Colonial contest took place in 1894 between Port Elizabeth and Kimberley. Not only is the club an adornment to the city, but it is the envy of bowling clubs all over. The setting in the middle of St Georges Park and surrounding by the park's vegetation must make it one of the most beautiful setting for a bowling club in South Africa, if not anywhere. Sticking to yesterday's harbour theme. The left hand boat (the yellow one for those who don't know their left from their right) is the harbour pilot boat while the right hand one is one of the Port Elizabeth Harbour's tugs. The pilot boat takes the harbour pilot out to the big ships. The pilot then steers the ship into the harbour and not the ship's actual captain. The tugs are the boats that push and pull the big ships into place along the quay side. 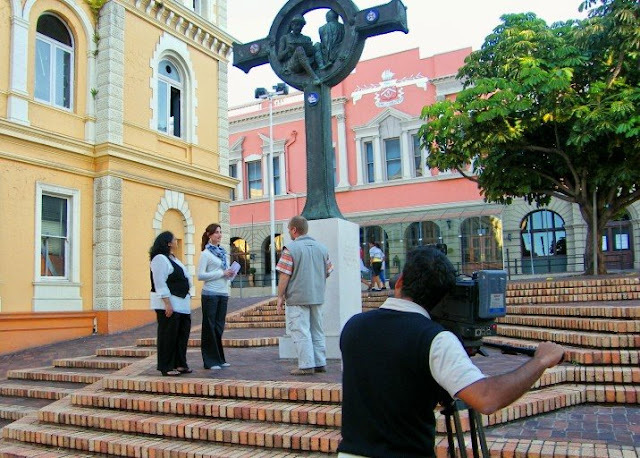 "Thank's for the photos of the surrounding areas- great for the tourists. But in addition to the postcard shots, how about some "real" shots of the city itself? Surely the industrial areas, suburbs and city centre are what a city is all about?" So in response to this, I want to make a statement and then a promise. Statement: I work in the tourism industry and I'm a travel and nature photographer so postcard shots is what catches my eye. Because of my link to the tourism industry I want to show people the scenic bits of town and to me there is nothing less real about these places than the industrial, suburban or city centre areas. Promise: But Barry makes a valid point as well. I promise that I'll try my best to capture a bit more of Port Elizabeth than the scenic areas as soon as I get an opportunity to get out of the office. 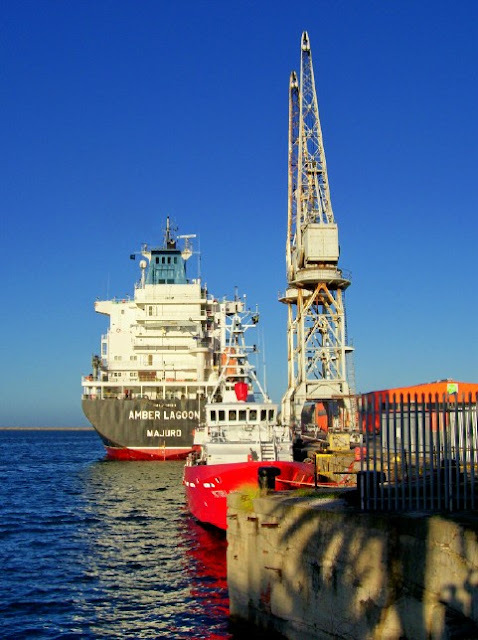 A scene from the Port Elizabeth Harbor. The orange shed on the left is the Fresh Produce Terminal from where the oranges from the Gamtoos Valley and Sundays River Valley are exported from. I'm not sure if the big ship is a cold storage ship or not. The small red boat is a coastal patrol vessel of Marine Coastal Management. 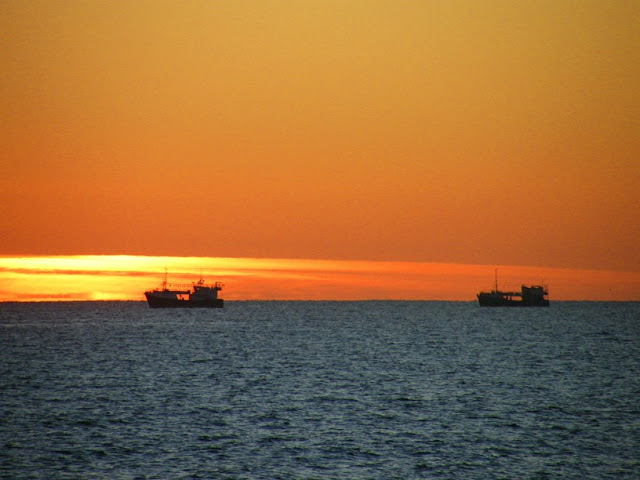 A couple of chokka boats at anchor in Algoa Bay at sunrise. Chokka is the squid that calamari is made from and the coast around Algoa Bay and St Francis Bay are the main fishing grounds in South Africa for it. Locally it is known as white gold. The chokka boats normally come into the bays to shelter against strong winds before heading out again. 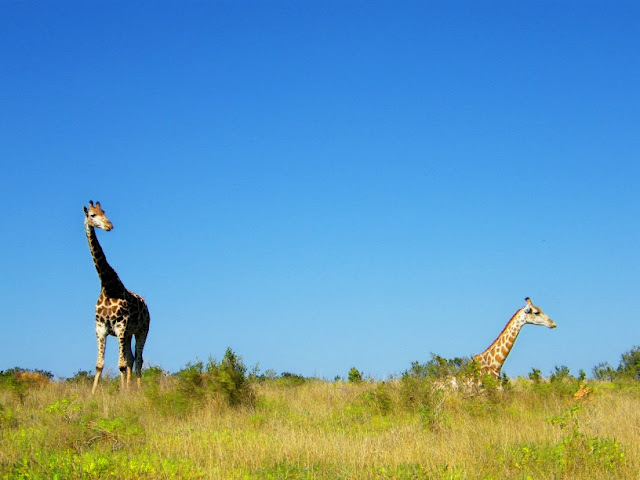 A couple of the giraffe we saw on the drive through the Seaview Game and Lion Park last weekend. 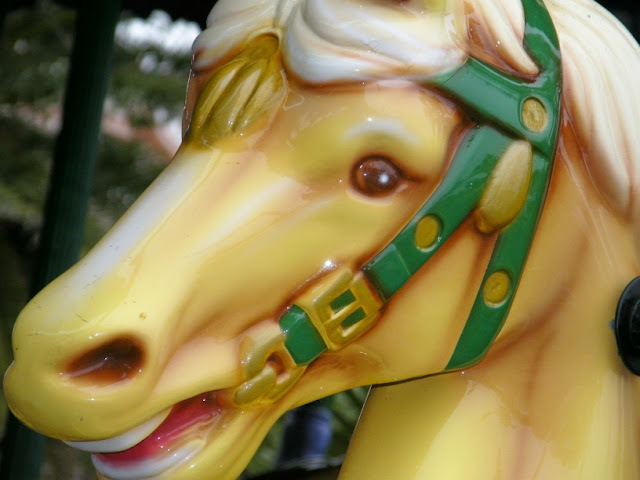 Seaview is about 20 kilometers from suburban Port Elizabeth and is an ideal half day outing for families. The Seaview Game and Lion Park just outside Port Elizabeth has become a institution over the years with many people who went there as children now taking their children. 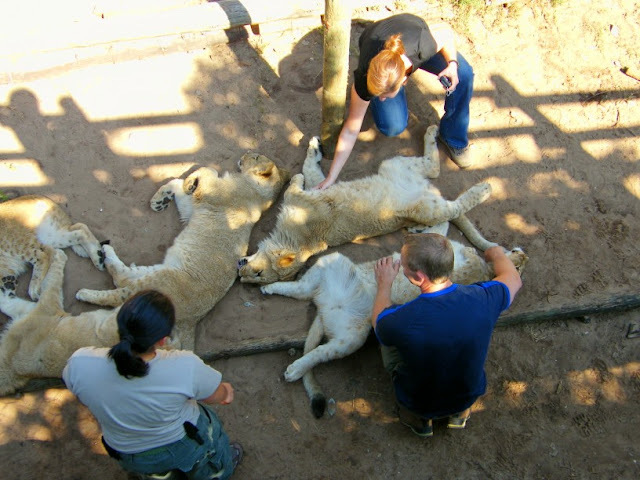 Seaview Game Park's main activity is a breeding project for white lions, although they also have normal lions as well as tigers and a number of game species which ca be seen as one drives through the park. On a Sunday at 12 noon they feed their lions in the main viewing enclosures and visitors can see this activity from just beyond the fence. One of the main attractions at the park is the fact that visitors can go and and spend time with the parks lion cubs (obviously where there is lion cubs). Normally people are allowed in with them from about 6 to 8 weeks of age (see here). When they get to about 10 months (as these above are), then they will only take people in when the cubs are very lazy or has just been fed. Its not that they are really dangerous yet, its more a case of them getting a bit rough when they want to play with you. 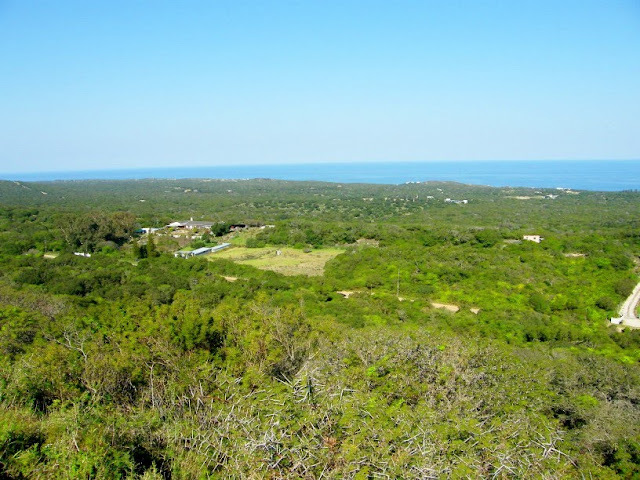 This is the view towards the coastline from the Seaview Game and Lion Park parking lot. The village (suburb) of Seaview is just out of view to the right of the picture. This is to the west of Port Elizabeth and the area mainly consist of farms and small holdings. Most of the farms are either dairy farms or houses stables. Over the last two days I have featured the view of the beach at Maitlands as well as the Maitlands dune. Today I want to finish off the visit to Maitlands with a picture of the view from the dune. Ok, so I didn't climb to the top, but I was still pretty high up the dune. Anyway, been there, done that. Looking down you can see the Maitlands river mouth and the lagoon. Port Elizabeth is situated to the left (east) of the picture. The pipes across the river is the main water supply line to Port Elizabeth from the city's water supply dams which are all situated in the Kouga area to the west of the city. Yesterday I showed you the view from the road down onto Maitlands beach, so today I want to show you what it looks like looking up towards the dune from the beach. I have zoomed in a bit, but you can still get an idea of how high the dune is. 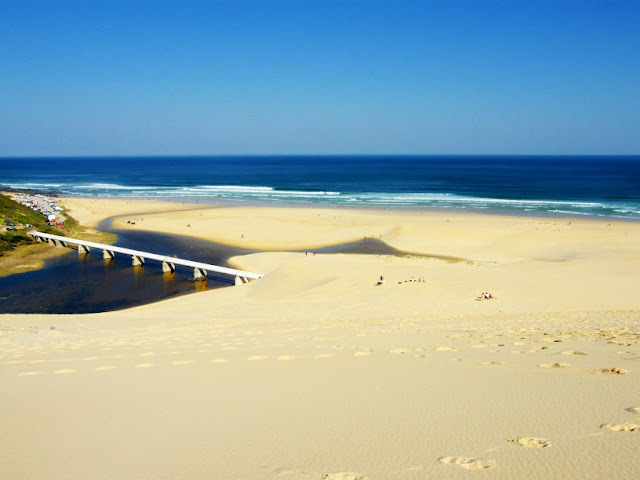 It is a very popular spot to go sand boarding with anything from proper sand boards to boogy boards and pieces of plywood. 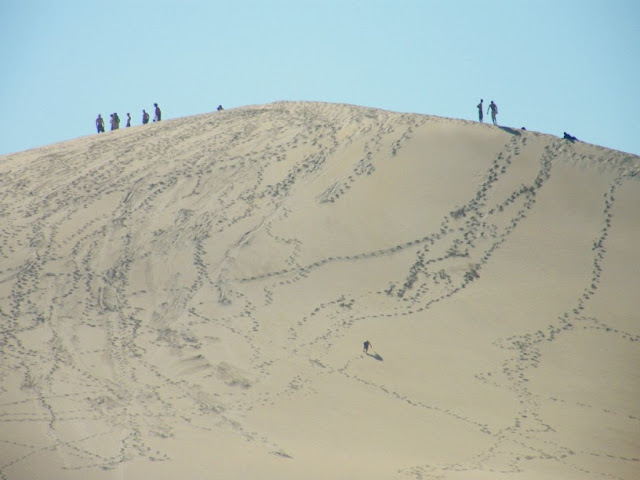 Tomorrow I will post the view from the top of the dune. We have had the most awesome weekend weather wise over this past long weekend. Any alien landing around here on any of the three days would have mistaken it to be a place in the mids of summer. On Saturday I took Chaos Boy to Seaview Game and Lion Park followed by Maitlands beach and we had such a super time in the outdoors. This is Maitlands beach with the Maitlands River mouth as seen from the hill approaching from the Seaview side. 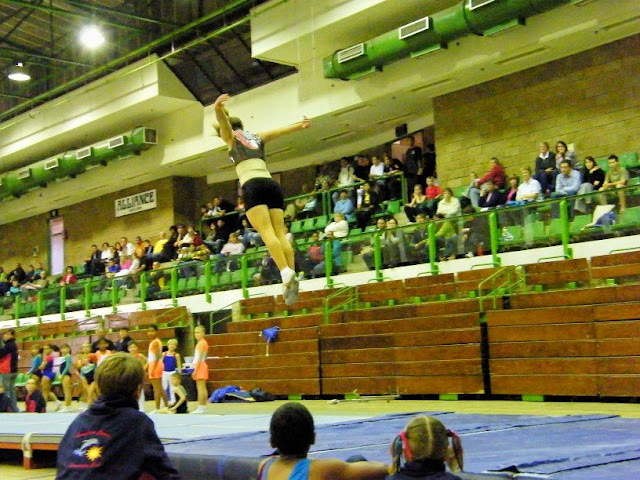 Yesterday we went to the Eastern Province Tumbling and Trampoline Trials in the Uitenhage Indoor Sports Centre. Chaos Boy took part in two items and got a gold and silver (see here). Tumbling and Trampoline in the Eastern Cape is of a very high standard and this becomes very clear when you realise that nine of the twenty gymnasts chosen to go to the Gymnastics World Age Group Games in Russia in November comes from Port Elizabeth. Of those nine, four belongs to Gymstars, Chaos Boy's club. The star in the team, Bianca Budler, was also chosen to represent South Africa at the World Championships which also takes place in St Petersburg a week before the World Age Group Games. The little stream running through Happy Valley is actually Shark River. 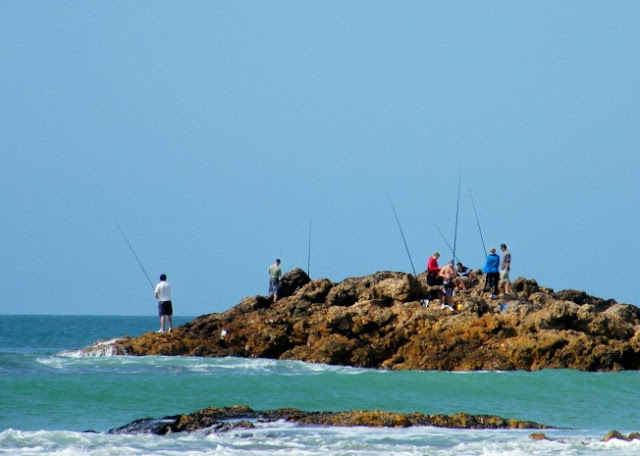 In the early days of Port Elizabeth Shark River used to be the town's main water supply. Shark River isn't really much of a river anymore and the water gets pumped from the bottom pool back to the top of Happy Vally which means that it doesn't have a river mouth into the ocean anymore. In actual fact the Eastern Province Rugby Stadium and the suburb of Forest Hills is situated in what used to be the river valley. I remember when we were small and we got to visit Happy Valley, I always wanted to cross the stream over the rocks in this picture. Now when we go there Chaos Boy is the one who wants to do it (and it gives me an excuse to do it as well). Today's post is a follow-up of yesterdays. Yesterday I showed you the Almshouses in the historic part of Bethelsdorp and told you that the original cornerstone is still visible. For today I wanted to show you a pic of the actual cornerstone. For Europeans 1822 may not be very old, but over here in Port Elizabeth it is a mere 2 years after the landing of the British Settlers. 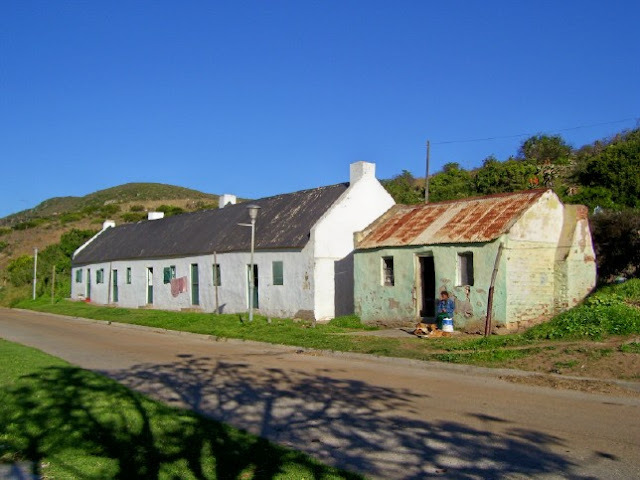 Bethelsdorp in the northern areas of Port Elizabeth was founded as the first mission station in the Eastern Cape by London Missionaries Van der Kemp and Read in 1802. They convinced the Colonial government of the Cape to establish a settlement for the indigenous people on educational, religious and social ground. The Almshouses built in 1822 was part of the Mission Station and can still be seen just behind the Van Der Kemp Memorial Church. 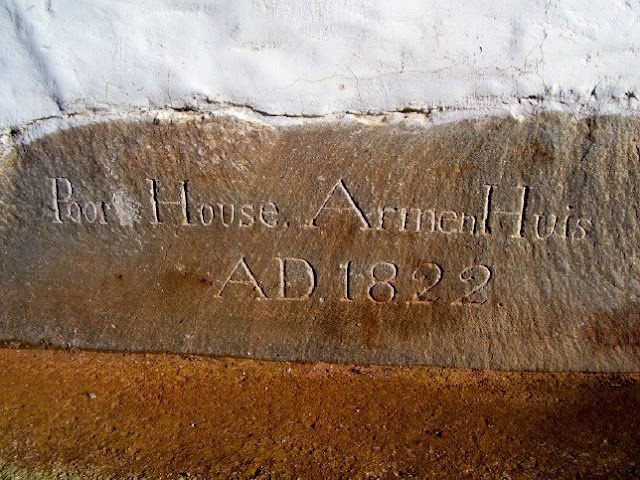 An interesting feature of the Almshouses is the original cornerstone which is still visible. 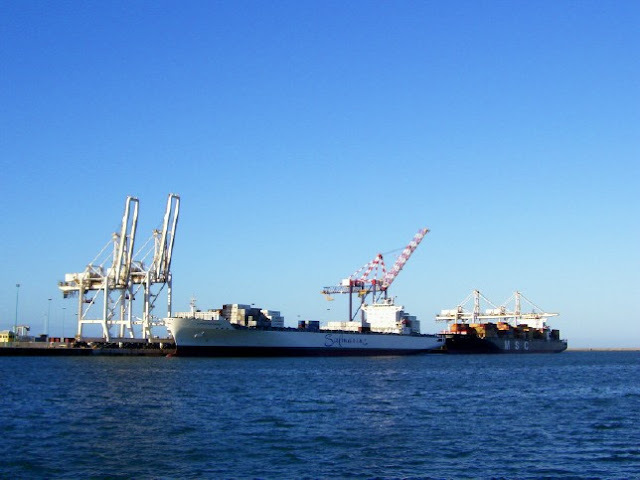 The Port Elizabeth harbour was built in 1935 and is used for the export of fruit, mohair, cars and manganese ore. It also has a very active container terminal as well as fishing fleet. The entrance channel to the harbour is maintained at a depth of 14.5m and has a generous width of 310m. The draught of vessels allowed into the harbour range from 9.6m to 12.1m. 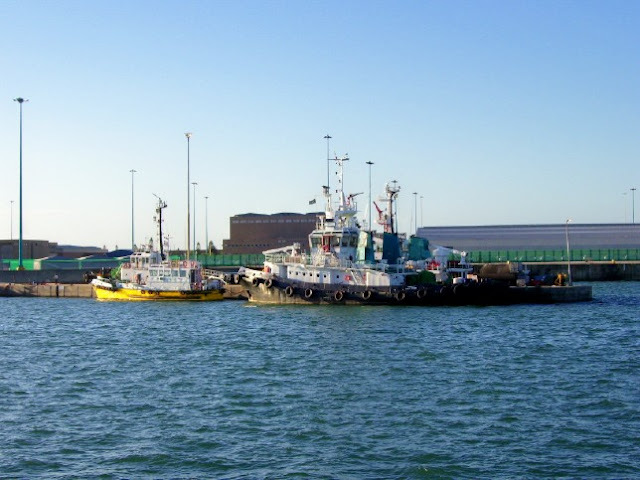 A lot of the current activities taking place at the PE Harbour will in future be taken over by the new deep water port of Ngqura being developed in Algoa Bay. 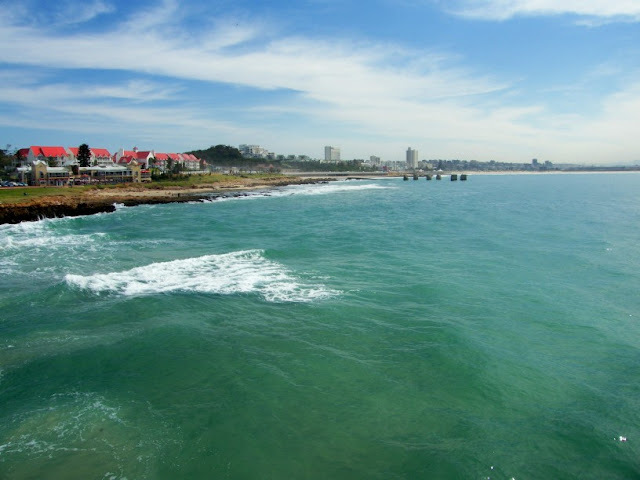 For more information on the Port Elizabeth Harbour, go here. Art in the Park takes place in St Georges Park every first Sunday of the month. Years ago when the market started it was a huge affair with over a hundred stalls scattered all along the park's pathways. Only hand made good were allowed in those early days. As the years went on the number of stall declined and people were also allowed to have bric and brac (the kind of stuff you would normally throw out, but here you buy it cause its antique) stalls. 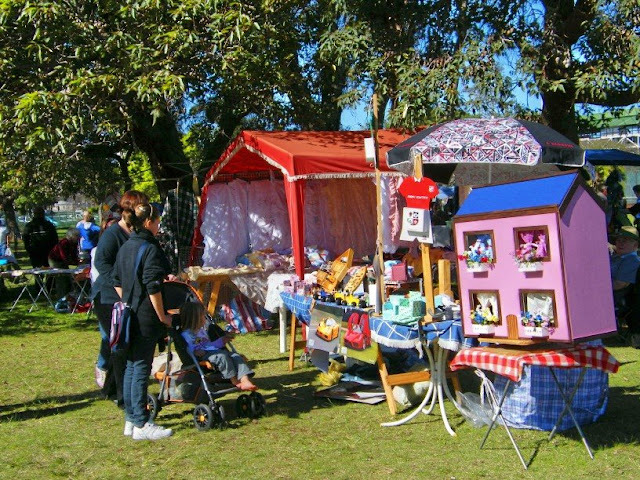 Over the last year or so the number of stalls at Art in the Park has dwindled. I went to the market on Sunday for the first time in quite a while and was shocked at how few stalls there were. Maybe its because its winter, but the day was an awesome one and those people there (and there were quite a few) had a wonderful time in the warm outdoors. I was fortunate enough to be asked to be part of a shoot for the SABC 2 Afrikaans magazine show Pasella today. Along with my colleague S, I got to take the the presenter, Vicky Davis, and the crew on a walkabout along some of the places on the Donkin Heritage Trail. Here we are standing at the Prester John monument across the road from the Feather Market Centre. The show will be broadcasted in the first week of September. 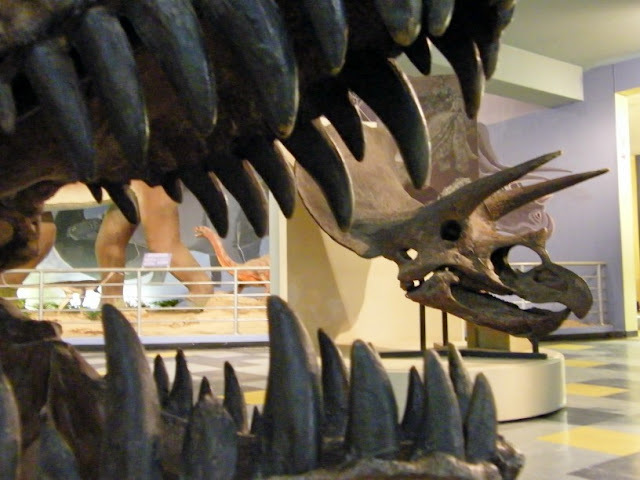 Looking at the replica skull of a Triceratops through the teeth of the replica skull of a Tyrannosaurus Rex in the Dinosaur Hall at Bayworld.